“What American Pastors Have To Say” from Christian Faith Publishing authors Bob and Carlene McKenzie features the collective wisdom of a multitude of America’s religious leaders. Readers will reap the fruits of wisdom from pastors, ministers, reverends, and renowned religious authors living across the United States. “What American Pastors Have To Say”: a collection of testimonies from religious leaders across America. 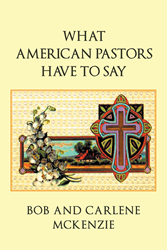 “What American Pastors Have To Say” is the creation of published authors, Bob and Carlene McKenzie. Bob and Carlene McKenzie were born and raised in the San Francisco Bay Area. They now reside in the hills above Santa Cruz, California. They have one daughter, Geneva, who also helped work on this book. Bob has owned a furniture repair and refinishing business since 1979. His customer base is located in the Palo Alto, which rests in the mid-Peninsula area. Carlene is a word processor who had worked for market research companies in the same mid-Peninsula area until they moved to Santa Cruz County. Published by Christian Faith Publishing, Bob and Carlene McKenzie’s new book presents the collective wisdom of religious leaders from across America. “What American Pastors Have to Say” is a collection of writings from pastors, ministers, reverends, and renowned religious authors. Bob and Carlene received these writings after sending Invitation Letters to religious leaders. They asked them to send their favorite sermon, personal testimony, or any other message they wanted people to hear. The response was astounding. More than 900 manuscript pages were received. The result was “What American Pastors Have to Say,” a treasury of inspiration, wisdom, ethics and wonder. It is a book for all ages and one for the ages. View a synopsis of “What American Pastors Have To Say” on YouTube. Consumers can purchase “What American Pastors Have To Say” at traditional brick & mortar bookstores, or online at Amazon.com, Apple iTunes store, Kobo or Barnes and Noble. For additional information or inquiries about “What American Pastors Have To Say”, contact the Christian Faith Publishing media department at 866-554-0919.